Hi everyone and happy Sunday! Today, I want to share a card using some versatile My Favorite Things dies! 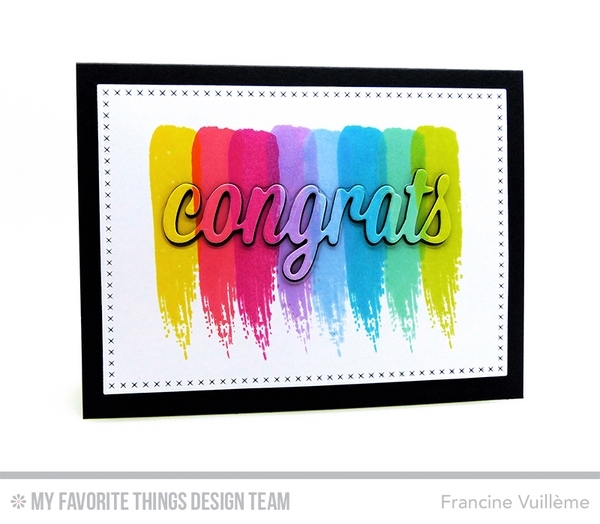 At first, I stamped a brush stroke from the Abstract Art stamp set in rainbow colors. Then I die-cut the word "Congrats" from the Celebratory Greetings set directly from the rainbow background and I adhered some tape behind the opening. To add dimension, I die-cut the word 4 more times from black cardstock and glued all pieces together with the colored one on top. To finish off my card, I inlaid the stacked word to the card base and the tape. What a bright card, isn’t it? Absolutely stunning! I am such a fan of rainbow and the camouflaged technique at the moment - always looks SO good! This is a wonderfully bright and excellently vibrant card!!! Love the way you did the sentiment word - It looks so very awesome!! You just always seem to delight and impress me!!! Have a wonderful day! !